The question our new work explores is: can we enable robots to use tools in the same way — through observation and experimentation? 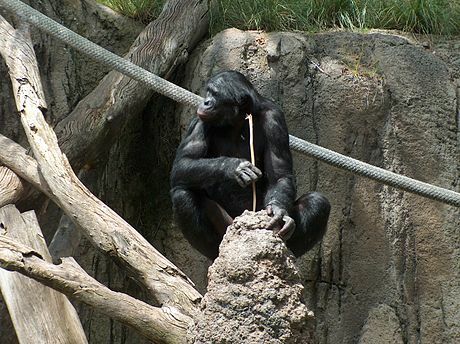 A requisite for performing complex multi-object manipulation tasks, such as those involved in tool use, is an understanding of physical cause-and-effect relationships. 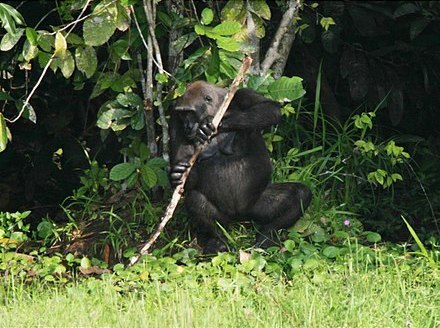 Therefore, the ability to predict how one object might interact with another is crucial. Our prior work has investigated how visual predictive models of cause-and-effect can be learned from unsupervised robot interaction with the world. After learning such a model, the robot can plan to accomplish a diverse set of simple tasks, including cloth folding and object arrangement. 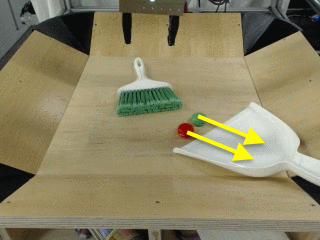 However, if we consider the more complex interactions that occur in tool-use tasks, such as how a broom can sweep dirt into a dustpan, undirected experimentation isn’t enough. Hence, taking inspiration from how animals learn, we designed an algorithm that allows robots to learn tool-use skills through a similar paradigm of imitation and interaction. 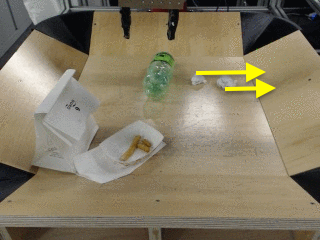 In particular, we show that, with a mix of demonstration data and unsupervised experience, a robot can use novel objects as tools and even improvise tools in the absence of traditional ones. Further, depending on the demands of the task, our method demonstrates the ability to decide whether to use the provided tools. In this post, we will describe how this works. 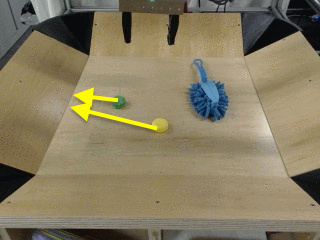 Our approach enables the robot to figure out how to use diverse objects as tools to achieve user-specified goals (marked by the yellow arrows). The robot wasn't told to use the provided tools but determined that it should from the task. First, we will use a dataset of demonstrations that illustrates how various tools can be used. Because we ultimately hope to learn a model that is useful for a diverse range of tool-use skills, we collect demonstrations for a variety of tasks with a variety of tools. For each demonstration, we record the sequence of images from the robot’s camera, gripper positions, and commanded actions. With this data, we can fit a model that proposes sequences of actions that enable the robot to use objects in the current scene as tools. And, to capture the range of behaviors in the demonstrations, the action proposal model outputs a distribution over action sequences. Since we want the robot to go beyond the behaviors in the demonstrations, and to generalize to new objects and new situations, we need a lot of diverse data. That is, data that can be collected in a scalable way by the robot itself. For example, we want the robot to understand how small mistakes, such as slightly imperfect grasping, might affect the future. So, we allow the robot to expand upon its experiences by collecting data on its own. In particular, the robot autonomously collects data in two different ways: by taking random sequences of actions and by sampling from the action proposal model introduced in the previous section. 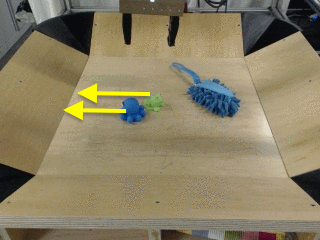 The latter allows the robot to grasp at tools and move them randomly. This experience is crucial to learn about multi-object interactions. Unsupervised interactions with household objects and tools. 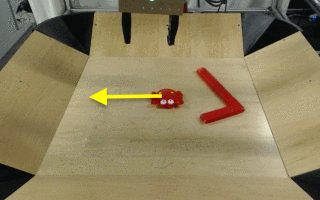 Our final dataset is composed of the expert demonstrations, the robot’s unsupervised experiences with various tools, and data from the BAIR Robot Interaction Dataset. We use this dataset to train a dynamics model. Implemented as a recurrent convolutional neural network, the model takes as input the previous image and an action at each timestep and generates the next image. 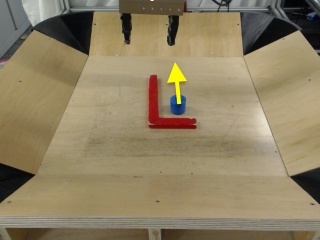 At test time, the robot can now use the model trained with imitation to guide the planning process and the predictive model to determine which actions will allow it to perform the task at hand. New tasks are specified through user-provided key clicks. For example, we can ask the robot to move the pile of trash onto the dustpan by selecting the center points of the rubbish and the desired final positions (see below). Specifying the task in this way does not tell the robot how to use the tool or even which tool to use in scenarios with multiple candidates, and the robot has to figure this out during the planning process. We use a sampling-based planning procedure that leverages the action proposal and video prediction models and allows the robot to accomplish a variety of tasks with a number of different tools and objects. In particular, action sequences are initially sampled at random and from the action proposal model. Then, using the video prediction model, we predict the outcome of each plan. Video predictions corresponding to different action sequences for the same initial scene. By taking the top plans and fitting a distribution to them, we can repeatedly sample and improve upon the best one, which is then executed on the robot. We experiment with this approach to enable robots to use new tools and achieve user-specified goals. Left: Initial scene with arrows indicating specified task. Middle: Video prediction corresponding to the best plan. Right: Execution of the plan on the robot. 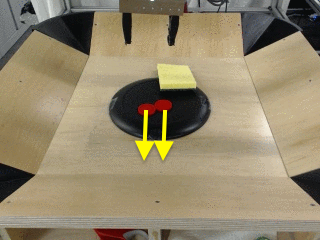 Scenario 1: The robot uses the tool to more efficiently move the two objects. Scenario 2: The robot ignores the hook and moves the single object with its own gripper. Beyond these examples, our quantitative results in the paper suggest that our approach is more general than learning from demonstrations and more capable than learning from experience alone. Prior works have studied tool manipulation with logic programming and known models under the task and motion planning framework. However, logic-based and analytic model-based systems are susceptible to modelling errors, which can accumulate during test-time execution. Other works have decomposed tool use into task-oriented grasping of the tool and using the tool with planning or policy learning. These methods constrain the scope of motions to those that involve the tool, while our approach is capable of finding plans with or without the tool based on the situation. Some approaches have also proposed learning dynamics models for tool use. However, in contrast to these methods, which either use hand-designed perception pipelines or forgo perception entirely, our approach learns about object interactions directly from raw image pixels. Performing tasks that are both diverse and complex involving previously-unseen objects is a challenging undertaking in robotics. To study this problem, we focused on a variety of tasks that require manipulation of objects as tools. 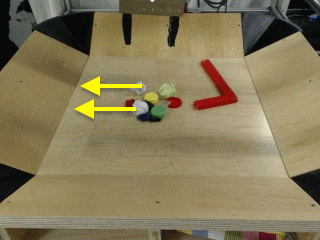 We demonstrated how our approach, which combines imitation and self-supervised interaction, can enable robots to accomplish complex multi-object tasks with a multitude of objects, and even use improvised tools under new scenarios. We hope that this work represents a step towards making robots simultaneously more general and more capable, so that they one day can perform useful tasks in everyday environments. I would like to thank Chelsea Finn and Sergey Levine for their valuable feedback when preparing this blog post.